We've received amazing feedback from customers using Morpheus: the Electronic Anesthetic Sheet. Being one of our newest products, we understand it can take a little time to get acquainted with it. Here are 5 quick tips to remember when using Morpheus. It is possible to save your procedures as templates. You can do this by starting a new pre-operative page and entering in the desired pre-meds, induction agents, fluids, etc. Then, you must start all medications and then hit 'start anesthesia.' From the intra-operative page choose 'edit' then choose 'menu.' Here you can save this procedure as a template. Click here for a video review. You should take the first set of vitals using the flow sheet. This is because the vitals will auto-fill in your pre-operative page. 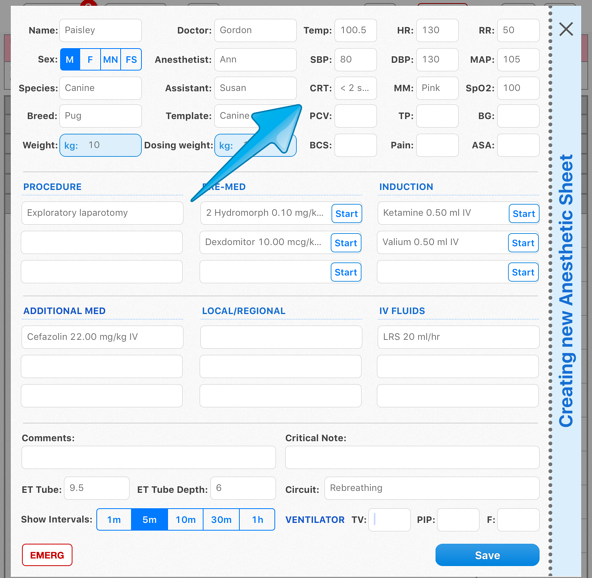 Use the comments section on the pre-operative page to make any notes on the procedure at any time. For the time being, these comments do not transfer post-operatively, so you should save them in the tech notes section. Each procedure a patient undergoes can be timed (along with the anesthesia time). These timers are found at the top of the page. Anytime you need to make a change within the intra-operative page, be sure to hit the 'edit' button. You can add to the chart at the bottom of the page, or change your monitors. Did these tips help? Feel free to leave a comment.